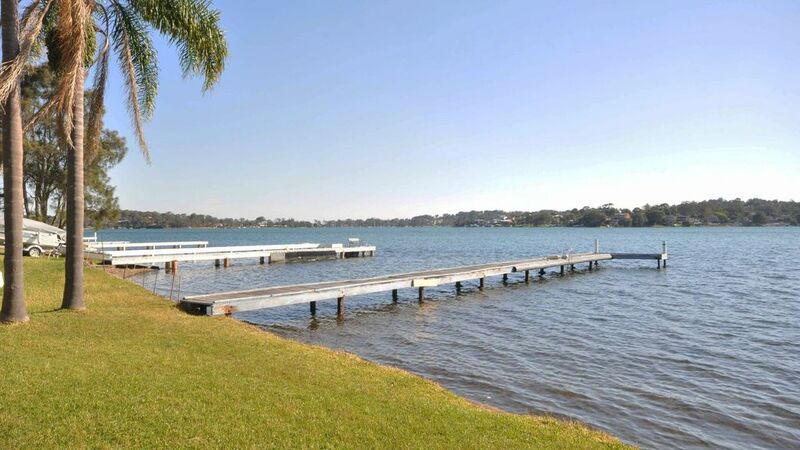 been recently renovated and is on the lakes edge with fabulous views of the Lake. With its own jetty, you are able to bring your own boat along, or just try your luck at fishing for bream, flathead etc. you want. You can just sit and watch the boats cruise by and the pelicans come in to land on the jetty and infront of the studio. The studio can sleep up to 4 people, 1 queen size bed and 2 pull out single beds. There is ceiling fans for the circulation. A kitchen with the usual modern conveniences and also a new frig, oven, microwave. Inside there is also 55” led TV/Blue Ray player and docking station. There is a gas BBQ undercover for those who love to BBQ by the waters edge and also sun lounges to sit and relax on. A combined toilet/laundry room with washing machine and dryer, undercover clothesline are available for your use. Ironing board and iron are also available. One studio room with a queen bed and 2 pullout sofa beds. Linen can be hired for $20/bed. We supply doonas, blankets and pillows only. crockery, cutlery, cookware and utensils. Gas bbq undercover outside in the breezeway. Dining room table and chairs for 4 people. Bathroom with shower over the bath, vanity and mirror. Undercover BBQ area with table and chairs. Also sunlounges available for use. No pets, smoking or parties. shops which has an IGA, newsagency, bottleshop, pharmacy, ATM and service station. There is a public boat ramp approximately 1 km away. tracks and do the downhill runs for those who dare! The Hunter Valley is not far away is you wish to try some new wines. Location is great, as is the spot but it was overall pretty disappointing for the price. The studio was not clean and was a bit rough. The cabin is behind a home with s very steep driveway and nowhere to park other than the road. The entry door was very hard to open and close. Overall too expensive for the quality. If you're after a very relaxing holiday this is a perfect location and property for you. Just make sure you bring your own dishwashing liquids and hand soaps cause the bottles were empty. But other than that it was perfect. ?? Great location on the lakes edge. Access to the jetty for sunsets, fishing and boat access was fantastic - yes we caught fish. The studio - access was poor, a steep driveway with no lights all the way to the studio and no car turn area at the bottom. Studio itself was tired, inside we found some drawers and cupboards dirty and hairs in the shower/ bath unit. Furniture looked okay but sit on it and that was different. Studio itself is nice, but be sure to take photo's upon departure of EVERYTHING! We left the place as we found it (everything cleaned, garbage taken out etc.). 4 days AFTER checkout, owners have now accused us of having a pet on site, quoting "a pet had shed fur throughout the property". WE NEVER HAD ANY PETS come with us on our stay, yet owners have took it upon themselves and taken out $200+ from my account for 'cleaning bills'. This is ridiculous, and now we have to endure avenues in order to gain our money back from something that we haven't done!! Very frustrating!! As a word of warning BEWARE TO OTHER STAYERS, to avoid the headache either take photos of every gritty detail (floors, lounge etc) as silly as it does seem, or consider other options to stay.